Happy 100th Birthday (NPS) National Park Service! I could not think of a better way to celebrate the (NPS) National Park Service centennial than to visit Yellowstone, the oldest national park in the world. 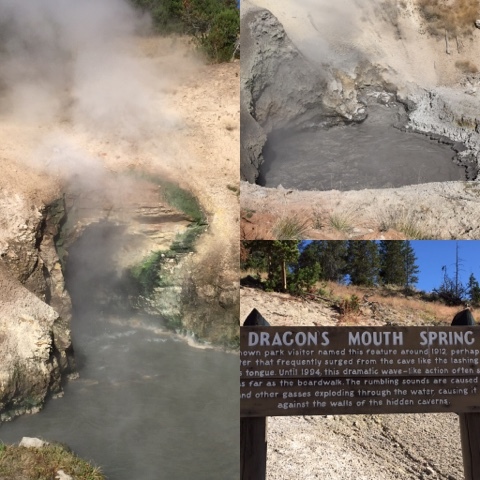 So this month I went on seven-state tour visiting National Parks, National Monuments and National Memorial and spent the bulk of the trip at Yellowstone National Park. Yellowstone National Park is located in Wyoming and includes some areas of Montana and Idaho. It is comprised of more than two million acres of the diverse landscape from the forest, valley, geysers, hot springs, craters, canyons, waterfalls, rivers, and lakes. I visited the three main attractions which are on the Wyoming side. We started at the North Entrance, by the old Roosevelt Arch to see Mammoth Hot Springs. Then drove past roadside forest mainly of needle pines and thousands of young trees said to have regenerated after the forest fires of 1988. We crossed a couple of continental divides to reach the famous Old Faithful but we watched smaller eruptions like the picture below, prior to the main attraction (the Old Faithful eruption). From the Higher Geyser Basin, we went to the Midway Geyser Basin and walked the boardwalk past the enormous Excelsior Geyser Crater to see the Grand Prismatic Hot Spring. Then we moved on to the Lower Geyser Basin and walked through the boardwalk past hydrothermal pools to see the Fountain Paint Pot. The next day was spent exploring the Canyon Village. We drove past broad-topped whitebark pines and spire-shaped subalpine fir and meadows. Then on to the Brink of Upper Falls, where we stood beside the Yellowstone River thundering over a lava cliff. Less than a mile later I was staring in awe of the spectacular views of the Grand Canyon of the Yellowstone River and its waterfalls. We lingered at the Artist Point to admire the view of the canyon and the Lower Falls, the view painted by Thomas Moran, that inspired Congress to declare Yellowstone a national park. Finally, we drove past the Hayden Valley to see the mud volcanic area and the Dragon's Mouth Spring with a very offensive odor. And of course, we spotted a few wildlife along the way.